The Christmas season at Moss Cottage holds a special place in many peoples hearts including my own. We've always worked so hard to bring you an experience worth waiting for and when we hear those first relaxed sighs as you walk through the door and the words "now, the Christmas season has begun" or "it just doesn't feel like Christmas until my visit to Moss Cottage", we know that our hard work has been worth every paper cut, wire poke, the pitch stained hands, late nights and early mornings, sleep deprived brain drained, moments of joy, uncertainty and anticipation. And while I love seeing you come through those doors to forage and gather the little bits of goodness that you so graciously cart off and into your homes, your private spaces, creating seasonal memories for you and your families, there's always so much more I've wanted to be doing for you and this is the year. Yay! I've been searching for a long, long time but I'm picky ~ about the surroundings, the feeling of a place, wanting both that rustic and industrial combination and this past February, that "place" finally came to be. The lounge at The Chanterelle, while still very much in the construction phase when I first visited, the exposed brick walls and those stunning hight ceilings had me hooked and I booked it ~ for one glorious evening in November just a little over 3 weeks from now. 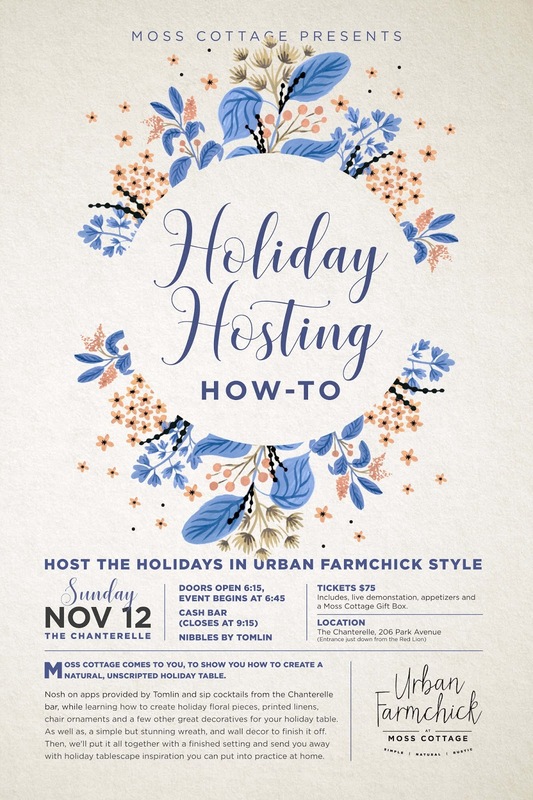 A special event evening where I'll be sharing the Urban Farmchick/Moss Cottage style Christmas How-To. A relaxed, intimate evening on nibbles and drinks, gather your friends, join me and I'll take it from there. Whether it's in your eat-in-kitchen or formal dining room, make this the year you actually plan and host a simple but inspired gathering of family or friends. Tickets to this event are limited! You can book your ticket here. The remaining details of our Christmas Season will be coming at you via Newsletter (to newsletter subscribers) on November 1st before being shared on November 10th. It's going to be a fun season . . .